Photos from the international exhibition ComTrans'11 in Moscow I have divided into several parts, which will be published separately. 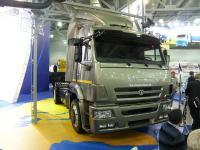 The biggest booth of the exhibition was the exposition of the KAMAZ automobile plant. In addition to the already presented below perspective models 5490, it consisted almost entirely of the already mass-producing trucks with restyling of 2010. New front mask is definitely refreshed design of not young models, while the updated interior was generally catastrophic necessary. There are some technical improvements too. For example, the engine power now comes to 420 hp (for Kamaz engine) or 300 hp (for Cummins engine), and fuel consumption reduced by 10%. But the most interesting of the whole range of updated Kamaz trucks was heavy duty tractor Kamaz 65226 with Cummins engine rated at 535 hp and GCW of 98,700 kg. At the center of the exhibition was placed the champion’s race truck of Vladimir Chagin with racing number 500 and also an updated look. In bus field there were also some news. The company presented first prototype of city bus, built on a KAMAZ chassis with the body of Brazilian company Marcopolo. Home sales will starts in second quarter of 2012. Also the novelty became the low-floor bus NEFAZ-5299H with a hybrid system.